Comments: This was the first SVGA sim, which meant that instead of VGA graphics of 320 x 200 pixels, we now had 640 x 400. 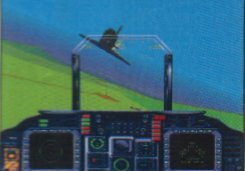 The visuals were similar to what we had previously only seen in military simulators and in a beautiful set of pastel colours. SVGA Harrier had immense replay value as the campaign never played the same twice, and it was entirely up to you as to how you won the ground war. Or didn't. This was the first sim I connected to MiGMan's home-built cockpit, and I spend night after night flying it, in the dark and with a flight suit, helmet and nomex gloves! (2002) Screenshots for this sim are very hard to come by nowadays - luckily Peter Nilsson had archived some screenshots from the Mac version on DAT and he kindly sent them in - with commentary! Thanks Peter! "These are small gifs, so there's no compression loss of quality but the 640x400 formats is a bit limiting of course. Also, I'm not sure the palette conversion is OK as the pictures seem a bit.. pale? Not much one can do now, right?"